A confession: I don’t like Halloween! Halloween has never been my favorite holiday. Sure – when I was younger I liked to get dressed up and “beg” for candy as much as the next kid. But the older I got, the more I came to dislike this day. Do I like the stress involved each year to find a creative and unique costume? Definitely no. I am the opposite of creative, and just the thought of showing up somewhere in costume is terrifying. What if I’m the only one that dressed up, what if my costume is lame?? In a group, I struggle to be the “real me” – I do not need to add a costume into the mix! Do I like to be frightened by haunted hay-racks and scary movies? Absolutely not!! I create enough panic and fear on my own, dwelling on the what-ifs in this scary world. What if I get in a car accident, what if something happens to my kids, what if one of us contracts some serious illness?? Seriously. I create my own fear! I don’t need to pay someone else to make me even more scared. I’m sure I sound like a complete fun-hater right now. But now with young children, I am learning to enjoy other parts of Halloween. Do I like fall weather, campfires and carving pumpkins? Of course. Do I like having candy around constantly? Yes. (Especially if said candy contains peanut butter and chocolate.) Do I enjoy putting my kids in cute costumes? Sure. Though I’ll admit that joy is dwindling quickly. When they were young, it was so fun to put them in those adorable, poofy costumes! 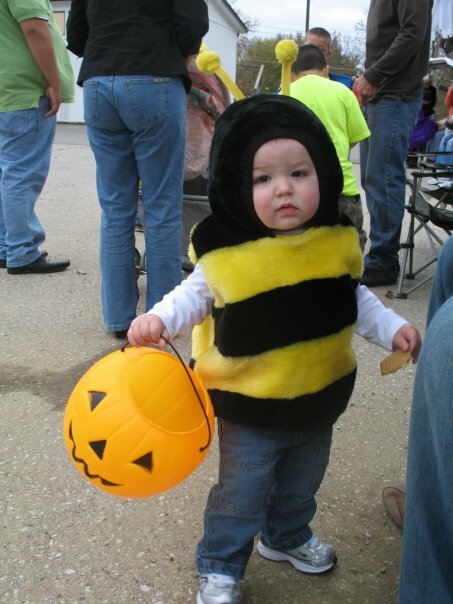 My son – the cuddly bumblebee – age 18 months. 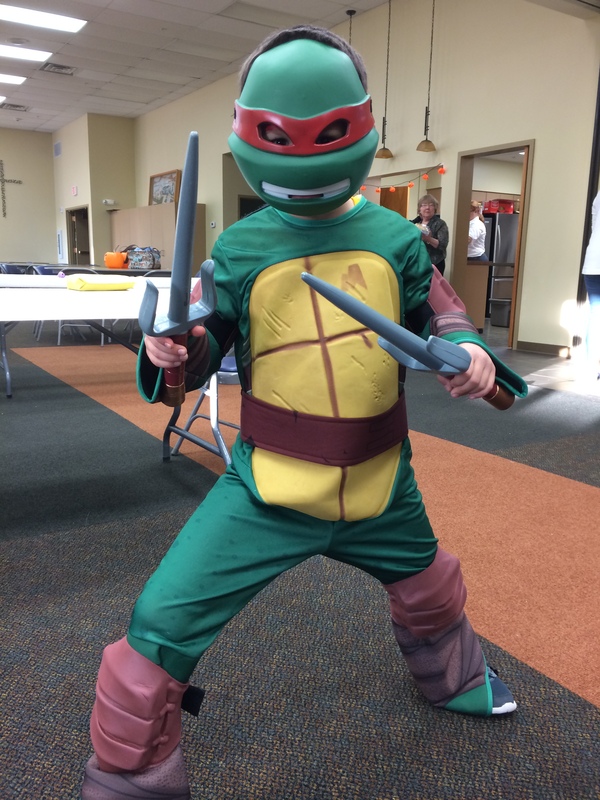 My son picked up on the scary part of Halloween this year – and he hates it! He notices the pictures of scary skulls, mummies and goblins. He lies in his room at bedtime and thinks of these scary things. We say over and over again – these things are not real; there is nothing to be afraid of! We say prayers and ask that God be with us, calm our fears, remind us with God’s love we have nothing to fear. The funny thing is I say these words for my own benefit as much as his! Unfortunately, much like me, he dwells and worries and allows fear to gnaw at his emotions. He doesn’t need extra fear in his life. So we try to avoid this scary side of Halloween – or at least use it as a lesson to distinguish between what is real and what is not; a lesson that when God is present there is no fear. If you like this costumed, scary holiday – great for you! I’m happy you’ve found an outlet, a release from the real world and a way to have fun. And if your children like this holiday, and can enjoy it without being over-commercialized and greedy, wonderful! But please don’t judge me if I’m content to simply carve pumpkins and drink hot cider on October 31. I will never love Halloween – and I think that’s OK! Categories: Family | Tags: costumes, fear, God, Halloween, parenting, peace, trust | Permalink. I could not agree more! I feel exactly the same way about this “holiday”. I let my kids do the trick-or-treating, but do not allow scary costumes. I have 3 girls so they are fine with this. I agree it is ok to not like Halloween!